Caption slip reads: "Photographer: Richardson. Date: 1952-04-03. Reporter: Swaim. Assignment: Newsboy catches burglar. 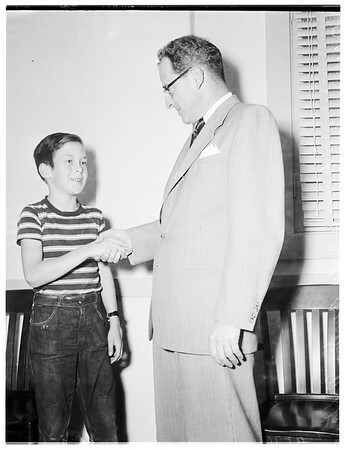 K39,40: Dennis White, 12, Examiner newsboy, being congratulated for work in aiding capture of burglary suspect by Municipal Judge H. Burton Noble".